Jamie Davis is our new teacher development coach. I’ll begin by thanking teacher development coach Jamie Davis for the fine work she has done all year supporting our new instructors and guiding our teacher induction program. This work is funded through our federal Title II dollars and I have heard nothing but compliments from teachers and administrators regarding the importance of Jamie’s work and the impact it is having on the quality of instruction being offered. Thank you for your willingness to do this important work for us! I also want to thank director of instruction Adam Hartman for the outstanding work he has done with the growth and development curriculum we are considering, as well as for the work he has done guiding our math resource adoption committee. With the passage of the Rural Sustainability Act, and a chance to secure another lucrative health grant, we should be in position to fund the purchase of the resources we’ll need to take the district forward next year in both of these areas. Let me also take a moment to thank all our nurses and health technicians for their continued hard work. 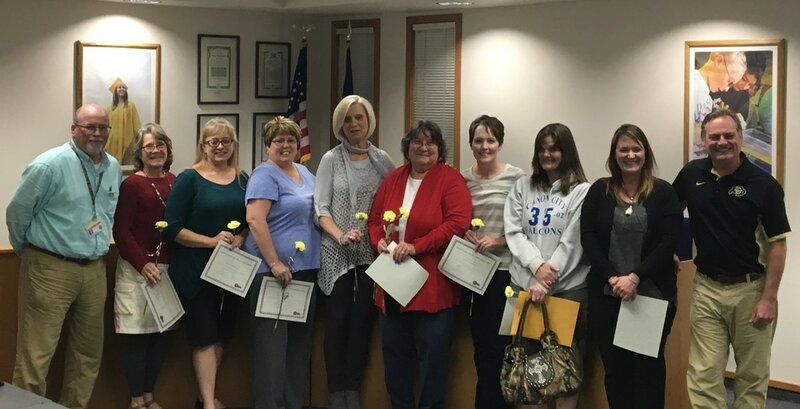 On Monday at our board of education meeting we took a moment to recognize these wonderful staff members. They included Linda Deleo from Lincoln School of Science and Technology, Jody Enderle from Mountain View Core Knowledge School, Patty Dodson who works on our School Health Professionals Grant, Kristi Hawver from McKinley Elementary School, Sheila Robeson from Harrison K-8 School, Della Rieger from Cañon Exploratory School, Donna Dalgarn from Cañon City High School, Stacy Murphy from Washington Elementary School, Julie Langrder from Cañon City Middle School, and district nurse Patricia Sallie. Finally, thanks to a grant from CCEOE and additional financial support from the City of Cañon City, the Cañon City School District was able to expand services offered through its partnership with Junior Achievement of Southern Colorado. This year community business volunteers supported us by teaching two personal finance classes at Cañon City High School, JA in a Day coursework to all 1st through 8th graders at Mountain View Core Knowledge School, JA for Kindergarteners at Harrison K-8, 5th grade JA at Washington Elementary School, and 7th grade JA at Cañon City Middle School. Business-school partnerships like this are truly valuable for our students. CCSD nurses and health technicians were honored at Monday's board meeting. With the Colorado legislature wrapping up its work last week our attention is now drawn to completing a preliminary budget aimed at accomplishing our instructional and operational program improvements, and working with employee associations to plan for nominal salary increases. As of now it appears we’ll have in the neighborhood of $300,000 toward apply to additional pay for our 500 plus employees for the 2017-18 school year. At a negotiations session last Thursday evening classified staff representatives and district leaders accomplished a lot of work toward revamping salary schedules to allow for staff who have suffered from frozen salary stops during the past severn years to gain a bit of relief. We are also putting together a short presentation for the BEST board to argue why our projects are worthy of almost 40 million dollars worth of grant funding through the program. By the end of the day Thursday May 18th we should here to what extent we have earned grant awards. Finally, we are also working hard to fill some administrative openings we have. Later this week we'll interview some candidates to fill an open high school assistant principal position. We'll also begin the screening process for filling the open Harrison K-8 principal position. Classified and district leaders negotiate salary rates for 2017-18. On Monday I caught up on correspondence and attended a board meeting and work session. On Tuesday I had a series of general meetings, then finished the day at the Cañon City Recreation Board meeting to learn how folks in Montrose advocated for and built a community recreation and aquatic center. On Wednesday I met over breakfast with classified association leaders, followed last minute legislative action related to school finance, and caught up on some year end office work. On Thursday I attended to budgeting and salary schedule related items and went to a joint session of CCEA and classified association leaders to learn about our budget before beginning salary negotiations with classified leaders. On Friday I attended a regional superintendent meeting, and met with director of personnel Misty Manchester about staffing related items. Jeff Peterson has worked hard to make our BEST grant competitive. On Monday I’ll attend a CDE regional training related to our federal programs application. On Tuesday I’ll attend a SAC meeting, a PCC advisory board meeting, a building leaders PLC session, and a special education parent connection meeting. On Wednesday I’ll start my day in my monthly meeting with Fremont County DHS director Steve Clifton and RE-2 superintendent of schools Rhonda Roberts. After that I will trek to Denver with operations manager Jeff Peterson to present our facilities grant concepts to the Building Excellent Schools Today boardI’ll begin Thursday at the Cañon City High School student-employer fair, I’ll drop in on a CCHS student presentation about school start times, hold a monthly touching base meeting with director of special services Lynnette Steinhoff, hold a district accountability committee meeting, and attend the Harrison spring choir concert. On Friday I’ll participate in interviews to select a new Cañon City High School assistant principal, and I’ll participate in the screening process for a new Harrison K-8 building leader. Colorado’s legislative session wrapped up last week and, though we were expecting a much worse outcome, the state house held the line by preventing another increase in the negative funding factor. This means our operations funding will increase next year by a little over $700,000, the constitutional minimum according to Amendment 23. After addressing our fiscal year 2017 budget deficit of $250,000 (caused by an unexpected decrease in student population as well as a decrease in students identified as at-risk), increasing our annual contribution to the Public Employees Retirement Association, and increasing our allocations for utilities, we should end up with $300,000 to address employee pay increases for a little more than 500 staff members. An unexpected bonus from this legislative session was the passage of the Rural Sustainability Act. This measure was aimed at addressing the viability of rural hospitals and transportation systems, but as a by-product an additional one time expenditure of 30 million dollars was allocated to rural and small rural school districts through an increase in recreational Marijuana taxation. In Cañon City our total allocation comes to just over $630,000, or $171 dollars per kid. Though the Rural Sustainability Act will not solve our fundamental school finance problems, the dollars are greatly appreciated and CCSD will invest them in one-time expenditures toward increasing learning opportunities for students (such as completing our reading intervention implementation, purchasing updated math resources, renewing instructional technology, and increasing our capacity to offer vocational education). As we develop our final budget in time for the June 30th deadline I will report more specifically about how we will invest these funds.